Just about the time we overhear conversations in bars about buying a couple barrels of crude oil, is just about the time we can tell you we’re entering unprecedented territory in the crude oil markets. It’s just about the time we’re getting calls from people asking the best way to invest in crude oil, the best way to profit from crude oil eventually rebounding. Chances are, you’ve already been profiting from crude oil’s decline (we’ll get to that in a second) so it might not make sense to bet on the other way, but we know better than that. We know there’s those among us who see this down move into uncharted territory (the largest down move in the past 30+ years) and see the opportunity for a bounce higher. Before you even have the thought of putting some skin in the game, it’s nice to know you’ve likely already profited from this crude oil move without having to put up any cash. Airline prices are at three year lows due to falling gas prices, and the average U.S. household saved around $700 in 2015 from lower prices. There’s even a gas station in Michigan selling gas at 46 cents a gallon. Those who sell the oil, instead of buy it – are on the other side of this equation, however – in a very big way. Oil tycoon Harold Hamm lost $9.2 Billion during this move, bringing his net worth from $18.5 Billion to $9.3 Billion. Overseas, Russian energy giant Gazprom has lost more than $300 Billion, and the Russian oligarchs have lost $11 Billion in 10 days of oil price drops, via the Telegraph. Whether its Saudi princes or JR from Dallas, we’re almost pre-programmed as modern humans to crave the type of over the top money that is “oil money.” And without the millions to start drilling holes or bloodlines to be a prince – trying to time this bounce seems like a pretty good chance to many. And consider the upside. A move back to just $45 a barrel, about where we were at Thanksgiving here in the US, would be a 55% move higher from the current $29 level. It seems like that could happen nearly overnight without anyone really thinking much about it (as we’d still be 60% down from mid-2014 prices). Whether it is longing for some Oil money, or a contrarian feeling that it can’t go any lower – there’s those out there that are wondering what the best way to play a bounce in Crude Oil prices is. And where do most investors go when trying to monetize an investment thesis these days…. to their friendly neighborhood ETF. There’s got to be a low cost ETF to invest in Oil prices, right. It’s the most popular way to play Oil, to be sure, with $3.3 Billion in Assets and $489 million changing hands daily, but is the Oil ETF ($USO) really the best way to ‘play’ a bounce? Well, first, remember what $USO’s stated goal is – to track the “daily” movement of oil. That doesn’t sound so nefarious; aren’t ETFs supposed to track the daily prices of the indices they track? Don’t investors want to track the daily prices? It’s not as cut and dry as it seems. Tracking the daily prices is good if you are going to hold the ETF for one day, or even a couple of days; but can be not so good if your investment thesis is oil prices will climb higher over an extended period of time. Why? Here’s where it gets tricky; because $USO’s long term price appreciation isn’t the same as the whole of all of its daily price appreciations. That’s because the ETF buys WTI Crude Oil futures contracts at the CME, and there are 12 different contracts in Crude Oil futures each year, you guessed it – one for every month. And while the so called ‘front month contract’ is trading near the number you see on the news every night (that $28 number that’s been splattered all over the news the past few days), the further out contracts, such as 10 to 12 months from now, may already reflect the idea that Oil prices will be higher. Indeed, the price for the December 2016 contract is $40, versus $30 for the front month. So there’s $10, or a 33% gain, already “built in” to the futures price. What’s that mean for the ETF investor? Well, if you are correct that Oil will rebound, and it does by around that 33% level, or $10 per barrel, over the next 11 months; the ETF likely won’t appreciate 33% as well. It likely won’t move at all, because it will have to sell out of its expiring futures positions and buy new (more expensive) futures positions each month (remember, there’s a contract for every month). This means it will essentially have to “pay” that $10 over the course of the year in what’s called “roll costs”. The process of moving out of expiring futures contracts into current ones is called ‘rolling’ the contracts. 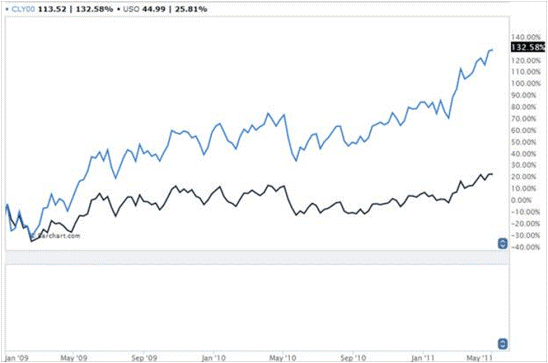 This is why $USO has drastically underperformed the “spot price” of Oil over certain periods of time. Just look at what happened during the last big rally for energy prices between January 2009 and May 2011, when $USO underperformed the spot price of oil by over 100%. There’s nothing quite as frustrating as having the right idea (oil prices are going higher), but the wrong execution. Getting a 20% return when the commodity the ETF is supposed to track sees a 132% return is enough to drive you mad. 3. Invest in our energy heavy Spread Trading Fund. 2. Buy the energy industry ETF, $XLE, just be aware that energy companies have a lot of things going on that don’t relate to energy prices (debt, shareholders, employees, lawsuits, spilling oil, regulations), and don’t use it to hedge against inflation as this guy suggested instead of managed futures…want more, the 3x energy sector ETF, $ERX – gives you three times the issues listed above. 3. Get involved in the distressed debt of the energy sector companies who issued junk bonds like it was their job for the past few years. If you like sale prices, we’re talking cents on the dollar here. 2. Catch the falling knife that is the commodity giant Glencore, who does stuff like buying tankers of oil but can’t seem to get the credit facilities they need. 4. Buy physical oil (a barrel, a tanker truck, whatever you’re in to). Just remember, that’s why prices are falling to begin with – there’s too much oil and not enough places to store it. You would now have the same storage problem. And it’s not like you can go down to the local gas station and re-sell your barrel of oil. Don’t just buy and hold Crude Oil. It’s known for violent swings and whether storing it yourself or paying an embedded cost to own the investment, there’s a high cost of carry. Instead, be dynamic. Invest in a strategy that can do well when Crude Oil rebounds, but also does well when it is in free fall. And can also do well when Oil is doing nothing at all. Get exposure to energy prices, not exposed by them! PS – if you’re determined to get on the long oil bus, get informed – here’s is Platt’s Oil Outlook 2016.